Spring-cleaning season is upon us. Is there a specific area of your home you’ve decided to tackle? If your closets have become disorganized and are overflowing with clothes, this could be the perfect time to give them a little TLC. Follow this guide on cleaning up and organizing your closet to make finding your favorite items of clothing easier. While you’re cleaning, you may discover items you’d like to hang onto but don’t necessarily have the space for. Instead of sacrificing organization or your clothes, rent a storage unit. Just Store It! in Clarksville has a variety of storage unit sizes to accommodate your seasonal clothing, holiday decorations, and so much more. Contact us today to reserve a storage unit. In order to organize efficiently, it will be helpful to pull everything out of your closet to start with a blank canvas. While you remove items, start putting them into categories so you can see the items you have that are similar. Removing everything will help you visualize how you want to organize pieces in your closet, plus it will be easier to clean your closet without anything in the way. Categorizing things will help with initial organization instead of having to stare at an overwhelming mountain of clothes. It will also help you see how much you have in each category and may help you decide what you can get rid of or store somewhere else. If you’re going to organize everything, it’s nice to do it in a closet that’s been deep-cleaned. Dust off any shelving, clean scuffs off of the walls, and vacuum the floor. After all, there’s nothing worse than setting your freshly-folded stack of sweaters on a pile of dust bunnies when you’re trying to get your closet organized and easier to maintain. Hang anything that’s delicate, formal, or sturdy. These would be items like lingerie, dresses, and heavy coats. Hang everything in the same direction and group things by length. This will give your closet and extra level of visual organization. Invest in matching hangers. 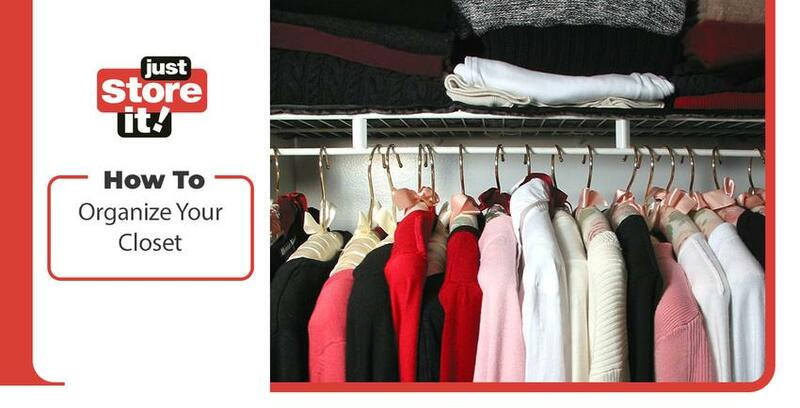 Your closet starts to look cluttered just by using mis-matched hangers. Invest in nice, sturdy cloth hangers or wooden hangers. Fold and stack thicker items. Thicker items like denim and sweaters will hold their shape better than thinner items if you fold and stack them. This is a good way to use shelving in your closet if you have it or want to install it. Store frequently-worn items at eye level. The purpose of organizing your closet is to make everything easier to look through. Store your favorite pieces right in front of you so you don’t have to go searching for them. Make the most of vertical space. Installing shelving or even using an over-the-door organizer are great ways to use vertical space in your closet. You can store shoes, jewelry, handbags, and other accessories easily. These are just a few ways you can organize your clothing and accessories a little better in limited space. How you decide to organize your closet will depend on how much clothing you have in each of your categories and how well you like different organization styles. If you don’t like hangers, pull out all the rods and just install shelving. If you don’t like folding and stacking your clothing, take out shelves and find a way to hang everything on hangers and hooks. The choice is yours! While you’re going through your items, you’ll probably find pieces of clothing that are worn out, don’t fit, or you just don’t like anymore. If items are worn out and no one else would be able to wear them, it’s safe to say you can throw these pieces away. If clothing just doesn’t fit or you don’t like it, consider having a garage sale or donating it. You may realize that you have items that you want to keep but don’t necessarily have a good space in your closet to store. If you have a lot of clothing that you want to keep but can’t store in your home, consider renting a storage unit. Just Store It! has many different storage units that you can store your formalwear, out-of-season clothing, and sentimental items safely and for as long as you need. Contact us today to reserve a space.